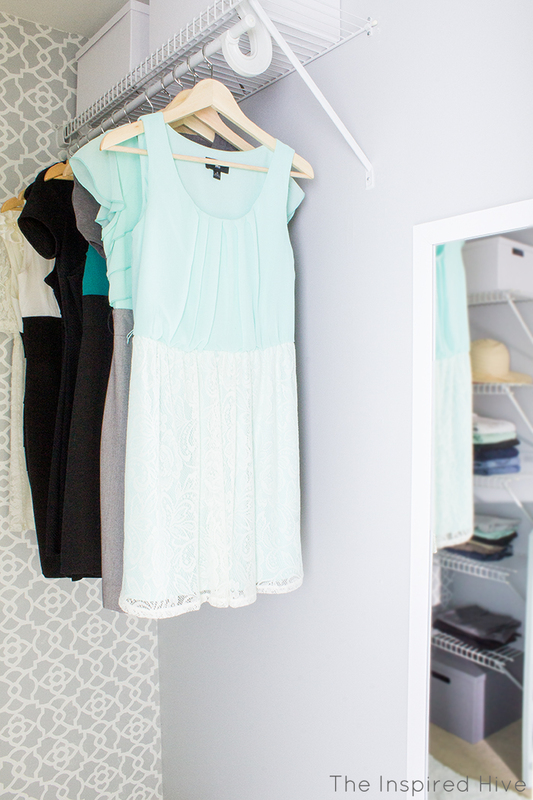 Every girl's dream is to have a big spacious, organized walk-in closet. When we bought our home, I was more than a little excited that our new master bedroom had a walk-in. 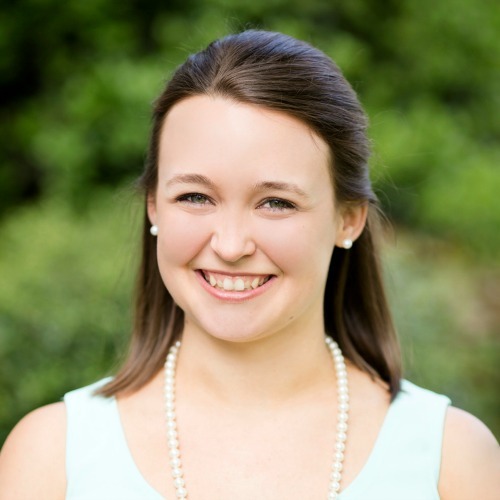 However, it quickly became cluttered and overflowing, leaving little to be excited about. 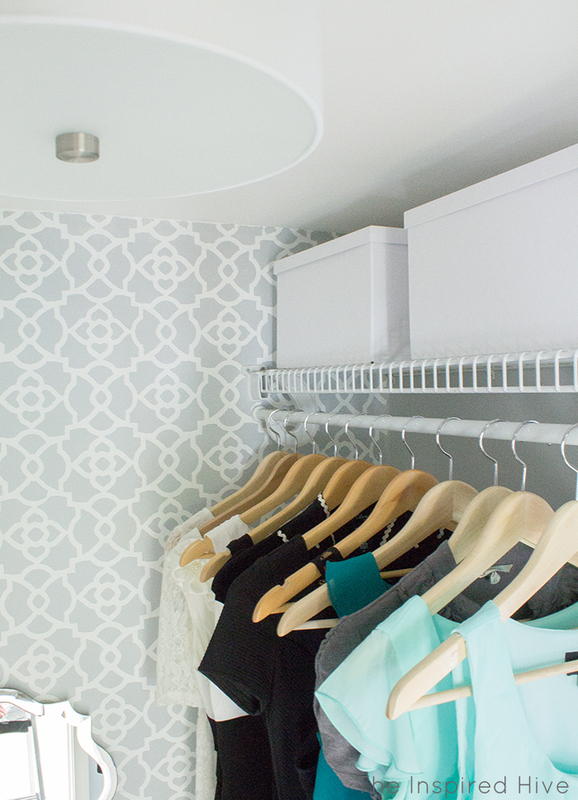 When my friends and I recently decided to do stencils as our Monthly DIY Challenge, it inspired me to finally give the closet a little attention and turn it into the pretty space I had daydreamed about! This post contains affiliate links for your convenience. Please see my disclosure policy.Some product provided by hayneedle.com. 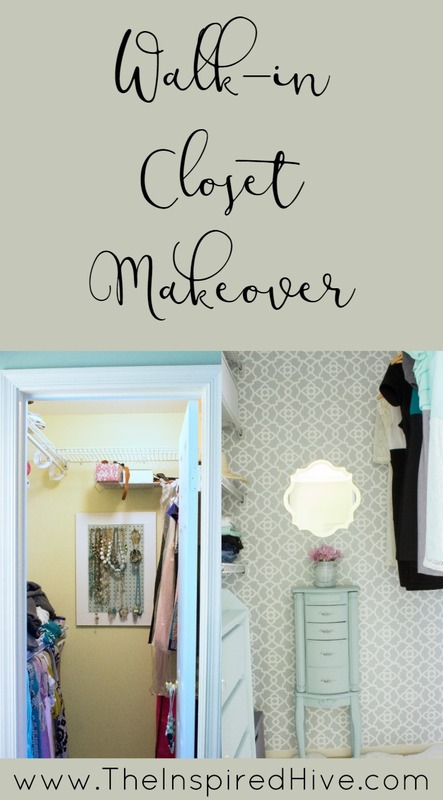 Here's my closet makeover To Do List...1. Stencil feature wall2. Paint walls3. Reconfigure shelving to make room for dresser4. 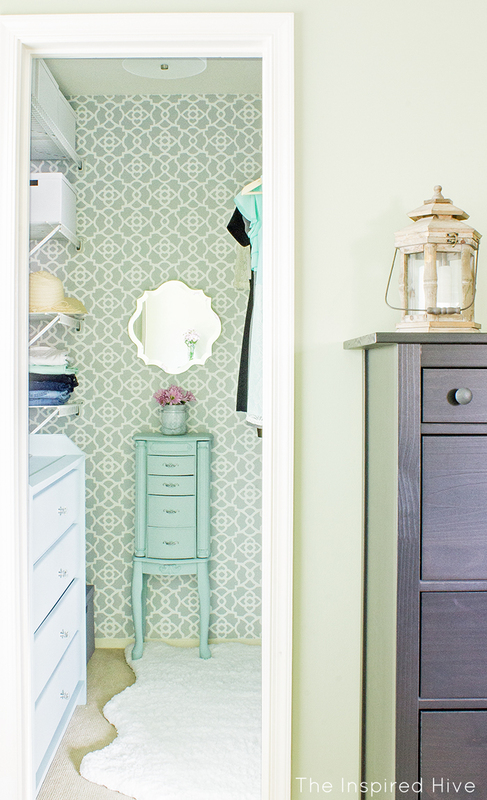 Paint jewelry armoire and dresser5. Install new lighting6. Get organized by using baskets, bins, or boxes7. Find pretty accessories! I wanted the space to feel roomy and organized and to be girly and pretty :) It might seem silly to have a pretty closet that nobody else will ever see, but this Momma is sooooo happy to have my own little feminine space in the house! Every girl deserves a little glam in her life, right?! Alright, ready to see it?!?!?! Ahhhh! I'm so thrilled with how it all turned out! I previously hated the ugly wire shelving that was in the closet, but I decided instead of spending money on new shelving, I would somehow make it work. It turned out that it actually looked a million times better once the walls were painted and the stencil was done. The grey and white made the white shelving pop! 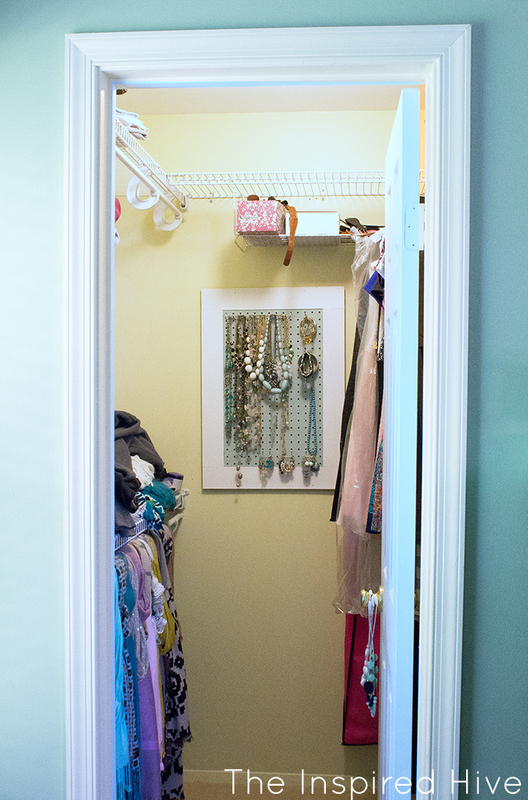 I wanted to make the closet feel more spacious and make room for a dresser, so my husband helped me cut the existing shelving down into smaller sections using a hack saw. To make it feel bigger, we also removed the door. 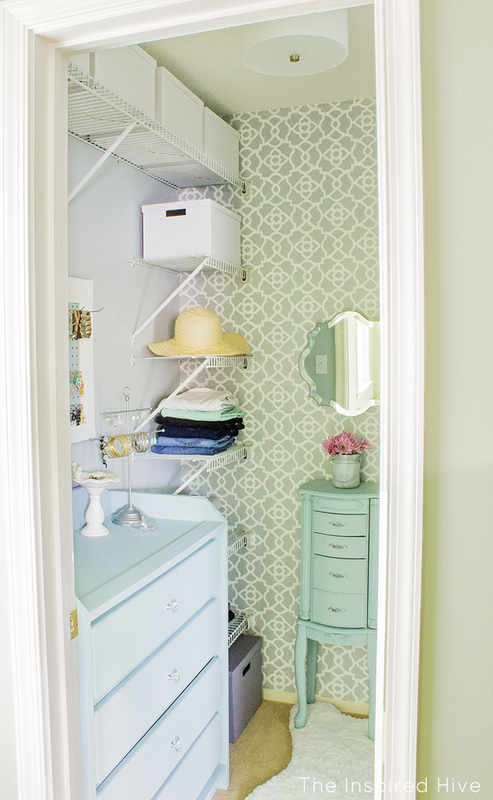 This enabled me to make use of the wall space behind the door and hang a full length mirror. Can we just talk about that rug for a minute? (Where's the heart eyes emoji when you need it?!) It's the Loloi Phoebe rug from hayneedle.com, and pictures do not even do it justice. I wanted a pretty rug for this space, but I wasn't expecting something so plush and comfortable! I could seriously curl up and take a nap on this thing! It's amazing! To get myself organized, I found these affordable cardboard storage boxes at Ikea. I used them to store things like belts, scarves, gloves, etc. That beautiful Livex Brighton light fixture is also from hayneedle.com. It's a finishing touch that really helped pull together my vision for the space. I think the drum shade adds to the girly feel I was looking for! 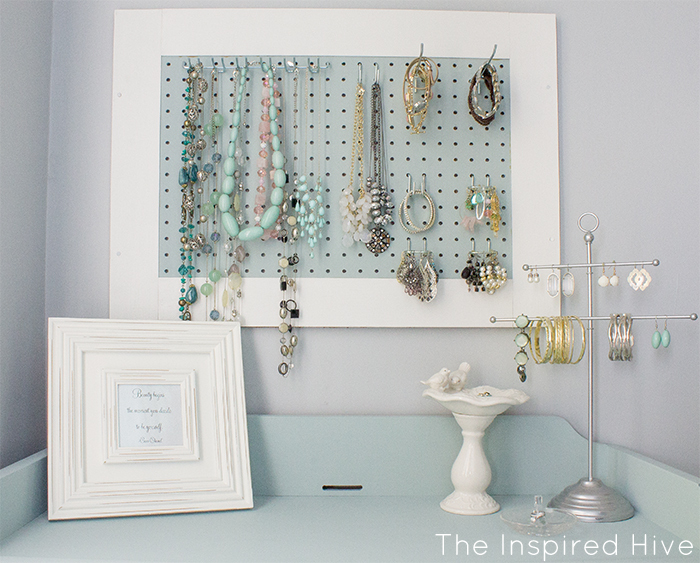 To organize my jewelry, I turned my DIY pegboard jewelry storage on it's side to fit the new location better. I found that jewelry tree on the right at Homegoods. I think I found the little bird jewelry stand at Michaels a few years back, and the glass ring holder was given to me as a gift when we got engaged. We had been talking about buying an extra dresser for our room for a while, but then I remembered I still had an old dresser I used in college. It actually used to be a baby changing table dresser. My mom gave it to me to use in college, and I took the table part off and painted it brown. 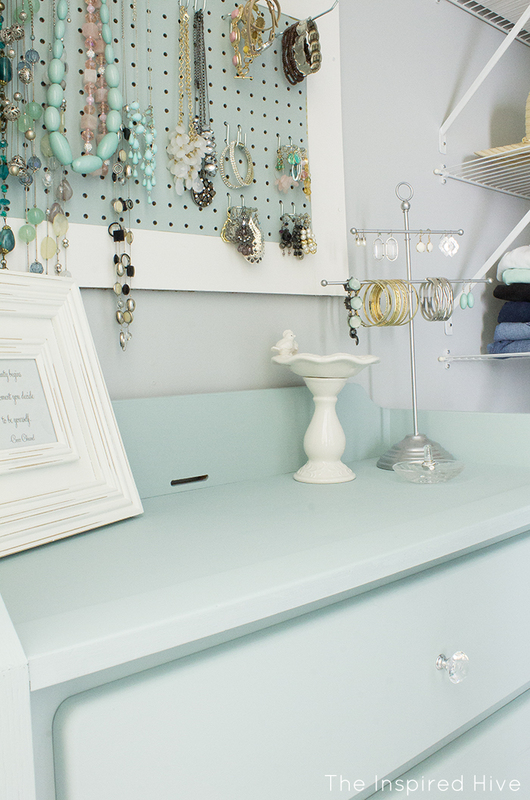 It's been sitting in our garage for a while now, so this was the perfect opportunity to give it new life with a fresh coat of paint and some new pretty knobs! This view below has got to be my favorite part of the whole makeover. 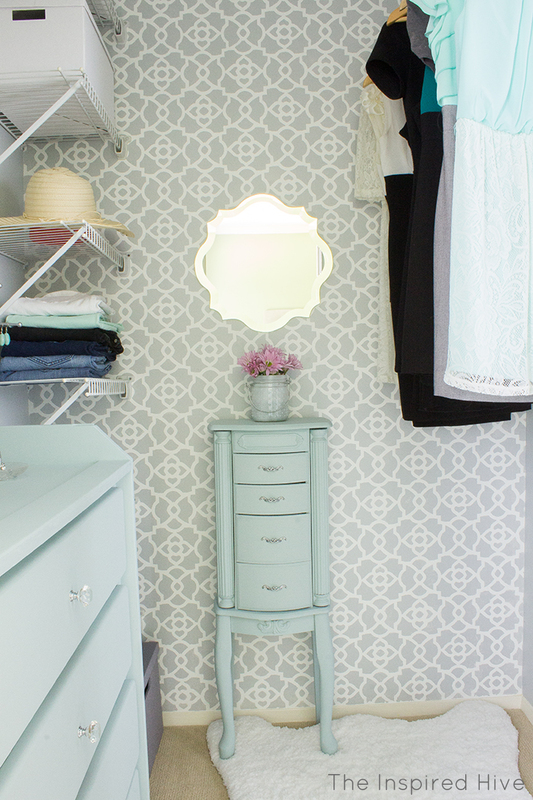 I gave my old jewelry armoire a major update (tutorial coming soon), and I love how it stands out against the stencil wall. 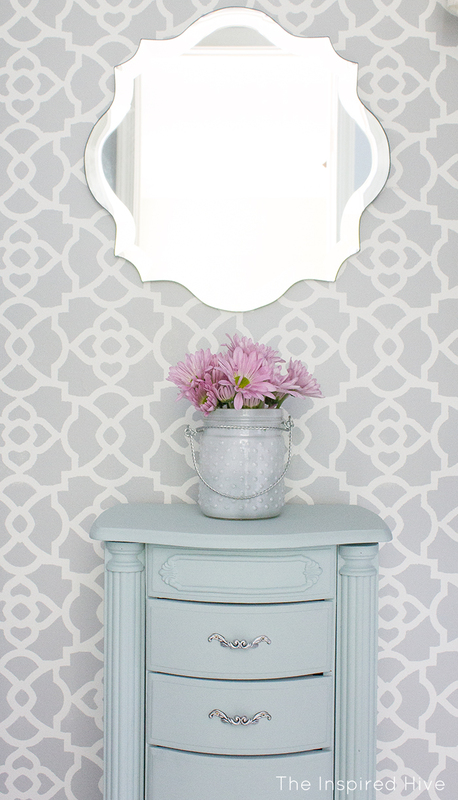 The Howard Elliott scalloped mirror from hayneedle.com is the perfect size to sit above it and the shape works so perfectly with the Moroccan stencil pattern. I seriously could not be more pleased with how it turned out! 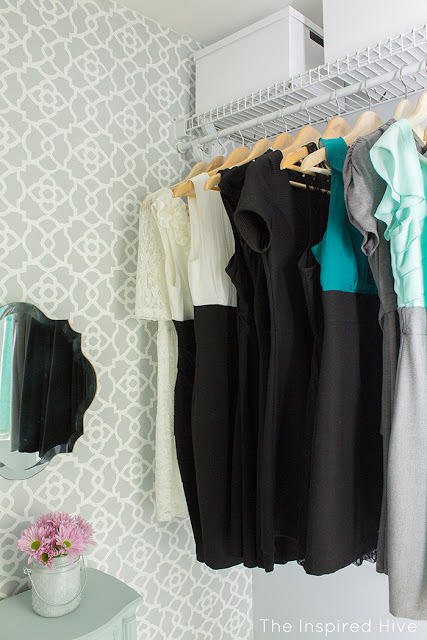 My ugly closet is now a beautifully organized space! Furniture paint- Americana Decor "Vintage"
Look at how pretty AND organized it is! LOVE it!! !